Development Fees and Development Cost Charges are an important aspect of development within the City. They help to offset costs of processing applications, acquiring new parks, and improving infrastructure. How do DCCs fit into a local government’s growth management framework? 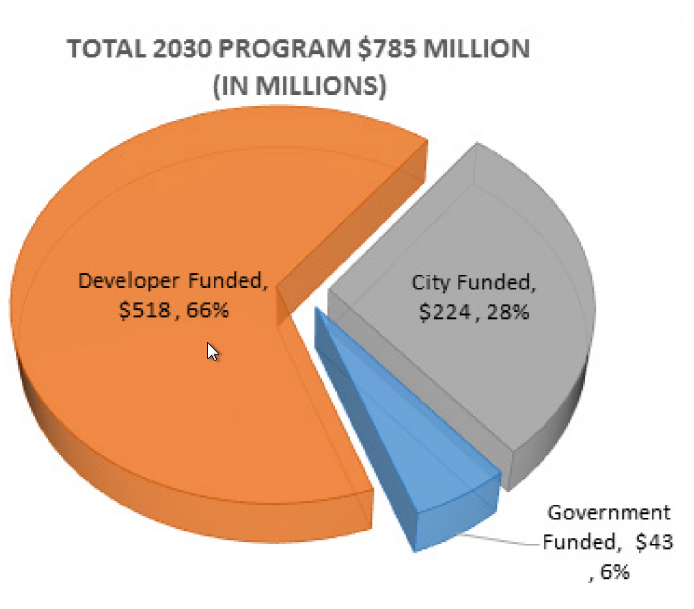 The City’s DCC Program is integrated with the City’s Official Community Plan (OCP) and 20-year Servicing Plan and Financing Strategy which details the major infrastructure improvements for water distribution, wastewater trunks and treatment, major roads and parkland acquisitions that will be required to accommodate the City’s projected growth. The City’s DCC program contains the individual works, identified in the servicing plan that are required to accommodate growth. The cost of each of the works is allocated in the program between growth and the existing population. The portion allocated to growth forms the basis of the DCC rates. Who pays for infrastructure improvements? Infrastructure costs should be paid by those who will use and benefit from the installation of such systems. Recognizing that costs should be shared in some way amongst benefiting parties, DCCs are a mechanism that distribute these costs between existing users and new development in a fair manner. Why is the DCC update required? This DCC update is required to update estimated infrastructure construction and land costs so they reflect current market conditions. If the City’s DCC rates do not reflect current market conditions, then DCC revenue will not sufficiently fund the infrastructure improvements and the City would have to defer infrastructure improvements or fund from alternate sources (i.e. taxation or utility rates). How do the City’s DCCs compare to other communities? 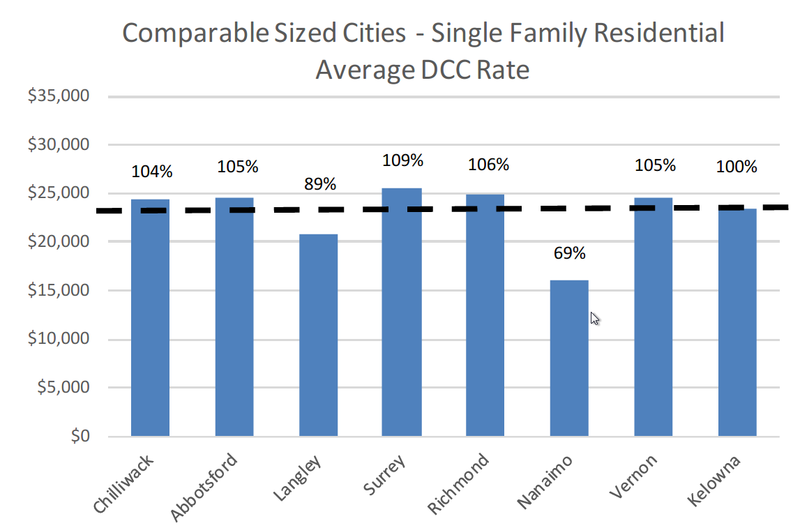 Kelowna’s DCC rates are comparable to other similar sized Cities. What are the current DCC Rates? The DCC rates are set through Bylaw that must be approved by Council. They can change every few years to reflect the future needs of the City. How does the Official Community Plan relate to DCC's? The Official Community Plan (OCP) is a long range planning document that helps to guide and shape the future of the City. It helps to outline which infrastructure project such as roads, parks, and wastewater are needed. Learn more here. Development application fees are required with any development application and are used to offset the cost of processing applications, advertising for public meetings, and legal and administrative fees. We also offer developer incentives to promote specific types of development. This includes urban centre incentives and housing incentives. View a detailed analysis of the Development Cost Charge Revenues for the year ended December 31, 2017, by service and land use type, along with other relevant information.